1. The lion’s diet consists of a variety of animals. Since they are carnivores, they generally eat other animals in the wild, including zebras, giraffes, and wild hogs. They have also been known to eat hippos and rhinos. When food is scarce, lions will even prey on elephants. 2. Since the 1950s, the lion population in Africa has been cut down by half. There are fewer than 21,000 lions currently living in the wild in Africa today. 3. Lions were once found in different parts of the world, including northern India, the Middle East, and Greece. Today, however, they are only found in parts of eastern and southern Africa as well as the southern region of the Saharan desert. 4. A pride is the term for a group of lions. It typically consists of about 15 lions, mostly female lions and their young. 5. Female lions do most of the hunting. They are nocturnal animals and they generally work in teams when stalking prey. 6. There is no specific mating season for lions. They can mate throughout the year. 7. The gestation period for lions is between 100 and 119 days. Mothers give birth to a litter of three or four lion cubs each time. Cubs only weigh about three pounds when they are born, which is typically less than one percent of their body weight when they are full grown adults. 8. There are two surviving species of lion – the Asian and the African. The Asian species of lion is endangered with only about 300 of them living in India right now. 9. A lion cub weighs about three pounds when it is born. By the age of two, it has already become a good hunter. 10. Fully grown adult male lions weigh between 330 and 500 pounds. They average about four feet in height and up to 8 feet long. Female adult lions weigh between 265 and 400 pounds and they get as tall as 3.5 feet. 11. Lions can go up to six days without drinking any water. 12. Lions are only second to the tiger when it comes to being the largest cat species in the world. 13. A lion’s roar can be heard as far as five miles away. 14. Lions can run as fast as 50 miles per hour. However, due to their lack of stamina, they can only keep up this speed for a short time. 15. The heaviest lion ever recorded weighted 826 pounds. 16. 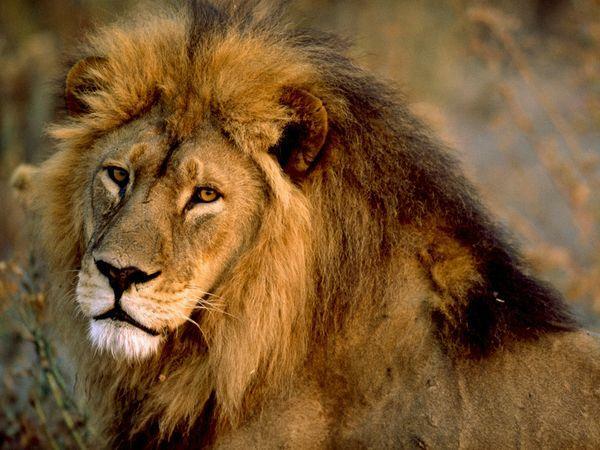 Several countries have the lion listed as their national animal, including England, Ethiopia, Bulgaria, Singapore and others. 17. Lions rest for about 16 to 20 hours each day. 18. Lions have been known to be able to leap distances of 36 feet. 19. Catnip can affect lions in much the same way that it affects the traditional house cat. 20. Another name for a male lion is “tom.” Female lions are often referred to as a lioness or a she-lion. Cubs, lionets, and whelps are also used to refer to baby lions. 21. A lion’s eyesight is about 5 times better than the eyesight of a human. 22. Even though the female lions typically catch and kill the prey, the male lion east first. 23. Lions almost never eat their entire prey. In most cases, they will leave a large portion of it for the vultures and other animals to feed off of. 24. Deforestation and habitat destruction are the two major reasons why the lion has dropped in population so drastically and been placed on the list of endangered species. 25. Lions, especially lion cubs, have several animals that prey on them. Some of these animals include hyenas, leopards, wild buffaloes, snakes and even eagles.